The Hagen quartet, although not very well known in the USA, is a fine German quartet with a substantial career in Europe. 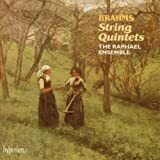 These recordings of the Quintets are very good and full of energy and passion. I particularly enjoyed the G major Quintet, which I think can stand along side the very best music that Brahms ever wrote. Gerard Causse, one of the top violists today, is a more than able collaborator. These viola quintets are not very often heard and it is really a shame! In this era of globalization, it amazes me that certain ensembles just don't make it across the pond. It's been going on for years, which would explain why musical giants like Backhaus and Schmidt-Isserstedt are pretty much unknowns stateside. One would have hoped that such egregious oversights would have ceased by now, but the Hagen quartet is Exhibit A that the practice is alive and well. The Hagen Quartet is an Austrian ensemble that is quite popular in Europe, but essentially an unknown on this side of the Atlantic. This is shameful as they are a unique and talented group. They eschew excessive vibrato, instead favoring a lean & clear approach. One might make the case that their performances display some HIP-influence, based on their clean lines, emphasis on dynamic contrasts, lack of oversentimentality, and focus on razor-sharp ensemble work that sacrifices some warmth in favor of illuminating musical architecture. For a composer such as Brahms, whose powerful and austere compositional style generates sufficient emotion (via restraint) without any additional effort from the performers, I find their approach appropriate and insightful to say the least. Brahms' dense and complex musical language is in full view here, where in heavier hands much might be lost. For those unfamiliar with his Quintets: unlike his Quartets - works which clearly lived in the vast shadow of Beethoven's monolithic contributions to the genre and come off as fitful, imperfect creations - the additional voice provided by the viola (played here by Gerard Causse) in the quintets allowed Brahms to be BRAHMS. These works both have a symphonic quality to them, in particular Op. 111, and fans of his larger-scale works are almost sure to enjoy this provided they can adjust to the smaller chamber dynamics. Rest assured that these are masterworks on par with Brahms' best work, even if relatively few available recordings exist (fewer still at the level of this set). Part of that has to do with the difficult logistics of getting together a quintet, as in most cases it requires a guest musician to sit with a quartet, or two guests to sit with a trio; and results here can vary depending on chemistry/rapport or lack thereof. Sound is quite good, if not perfect. It still has some of that "glare" that 80s digital recordings tend to exhibit, still it's a minor issue and the performances are so fine it almost seems like nitpicking. Liner notes are excellent, written in multiple languages, and clearly detail Brahms' life at the time these works were composed while also offering insight into the musicological aspects of them. I love these works, and I own several versions, including performances by the Amadeus quartet, Leipzig quartet and Raphael Ensemble. Still, this set is far and away my favorite. 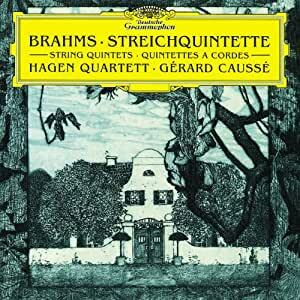 This disc earns a strong recommendation from me, as does the Hagen's rendition of the Brahms Piano Quintet Op. 34 which has many of the same virtues as this recording; although that title is sadly out-of-print and prohibitively expensive.